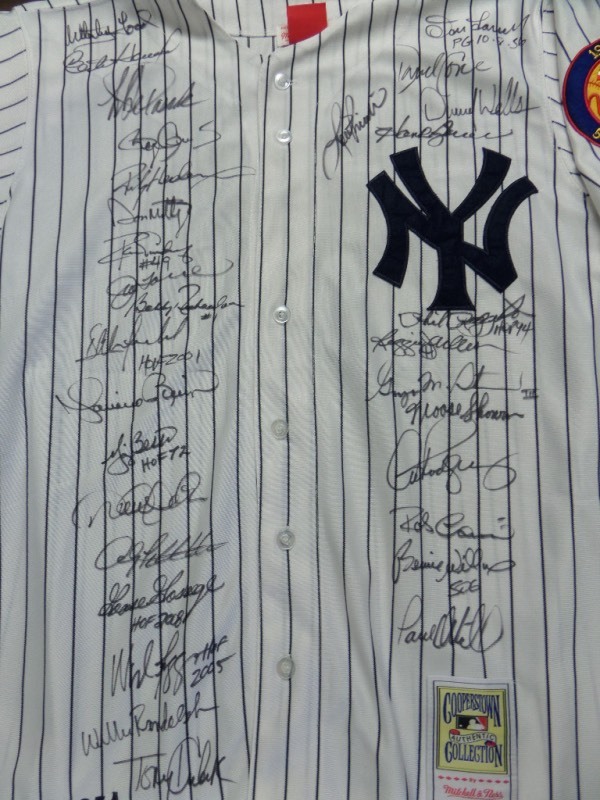 Coach's Corner - "Yankee Greats" multi-signed/guaranteed jersey. Go Back to Lot List "Yankee Greats" multi-signed/guaranteed jersey. This amazing, mostly card show obtained gem is a 10 all over, and signed by 30 in bold black sharpie. The jersey is a home white pinstripe, tagged by Mitchell & Ness from the 1990's, and has Mickey Mantle's #7 sewn on back. I see strong autographs from the likes of stars, fan faves and HOF'ers, including Ford, Clemens, Mattingly, Torre, Winfield, Rivera, Berra, Jeter, Pettitte, Boggs, Goose, Kubek, Larsen, Reggie Jackson, Arod, Steinbrenner and many, many more! Wow!! Value might be 4 grand on this pinstripe treasure.